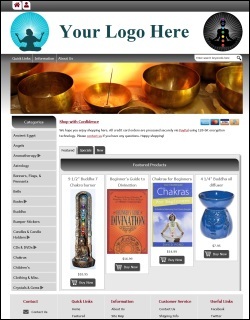 Get your own online New Age store. 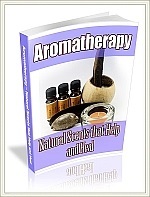 It comes preloaded with 4,000+ products. We install the software for you. Just open an account with the dropshipper (you’ll receive instructions when you order) and then we’ll upload your store and import the products to the database. 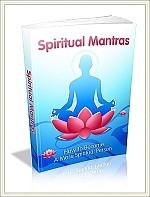 If you’ve ever wanted to run a spiritual shop online, this is everything you need. 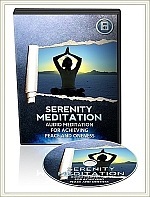 Sell metaphysical books, incense, healing & aromatherapy products, crystals, tibetan singing bowls, hindu items, buddha and goddess items, reiki products, new age jewelry, candles, pendulums, angel products, meditation & yoga supplies, etc. All products can be dropshipped directly to your customers, using your business name and address on the shipping label — this means you carry NO inventory or mess with any shipping hassles. 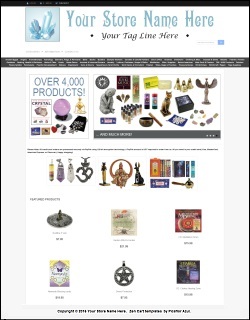 Your store comes with shopping cart, search engine, newsletter, and much more. 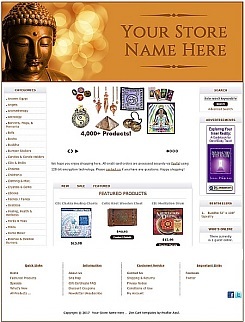 “Lotus” template – Click image above to see Demo. 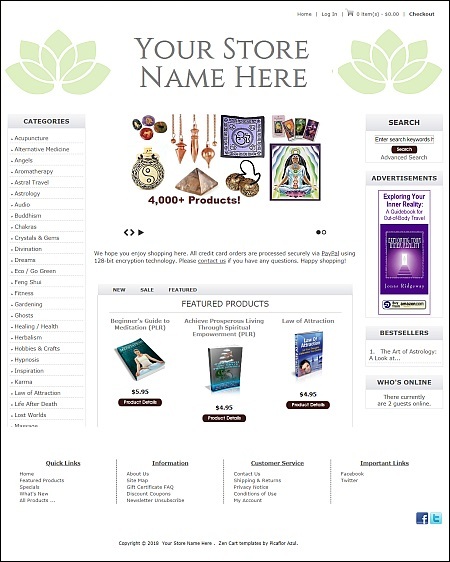 Preloaded with 4,000+ products, including jewelry, crystals & gemstones, Tibetan singing bowls, incense, herbs, tarot decks, new age books, music CDs, DVDs, reiki items, buddha & hindu items, psychic boards, candles, chakra products, meditation & yoga supplies, etc., etc., etc. Unbelievable amount of product, and everything comes from a single dropshipper and can be shipped directly to your customer (using your business name and address on the shipping label). This means you don’t have to keep any inventory, or box or pack anything (no trips to the post office). The dropshipper does all of the hard work for you. All you need to do is open an account with them (a Sales Tax ID Number is required) and then we will import the entire product database of 4,000 items on your behalf, and install the store for you. We will even create a header / logo graphic like the one in the store sample (see Demos above), or you can upload your own logo. Inventory Management is done by using the CSV file provided by the dropshipper (some editing required; instructions are provided or we can do it for you for $10 per month, four times per month). This allows you to keep up-to-date on the stock status of all 4,000+ items. After using the CSV file, all 4,000+ items will be updated. 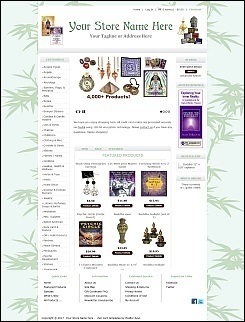 You will then have the latest info on what is currently in stock and how many of each item is available. If an item goes out of stock, your store will no longer allow that item to be sold. And if any previously out of stock items become available again, then those items will once again be available for sale in your store. When items are discontinued, they can be removed from your store completely by editing a file available from the dropshipper. Removing discontinued items is also included in our $10 monthly subscription service or you may remove the items yourself. 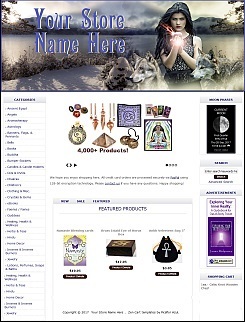 Everything you need for your own online New Age store. Your store comes with shopping cart, search engine, and can be set-up to process credit card orders using the installed PayPal module (your customers DO NOT need a PayPal account to order; they can order with or without a PayPal account; all they need is their credit card). Or you can use other payment modules (such as Authorize.net). 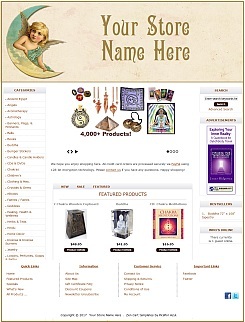 You can also add new products, or delete any products or entire categories that you may not want. You can edit or change whatever you want to make the store more to your liking, and use another template for a different design look. Services. 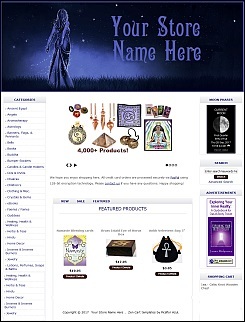 This store is also great if you have services you want to sell, such as Tarot Card Readings, Psychic Services, etc. Just add your service to the store and turn off the shipping module for that individual item and your customers will not be charged a shipping fee. You have this ability with any item in your store — you can turn on or off the shipping charge for any item. 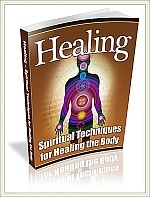 Click images below to see Demos. Click images above to see Demos. For us to install a store for you, you will need to get a web host and pick out a domain name. If you don’t yet have a web host, we recommend Just Host and pay only $5.95 per month with the Basic Plan (to get this low price, you pay 12 months in advance for a total of $71.40). You get 50 Gigabytes of Storage Space, Unlimited Bandwidth, and a Free domain of your choice. This inexpensive plan is all you need for a store installation and you’ll have room to grow. Other web hosts we recommend: Blue Host; Host Gator; Host Monster; and Web Hosting Pad. 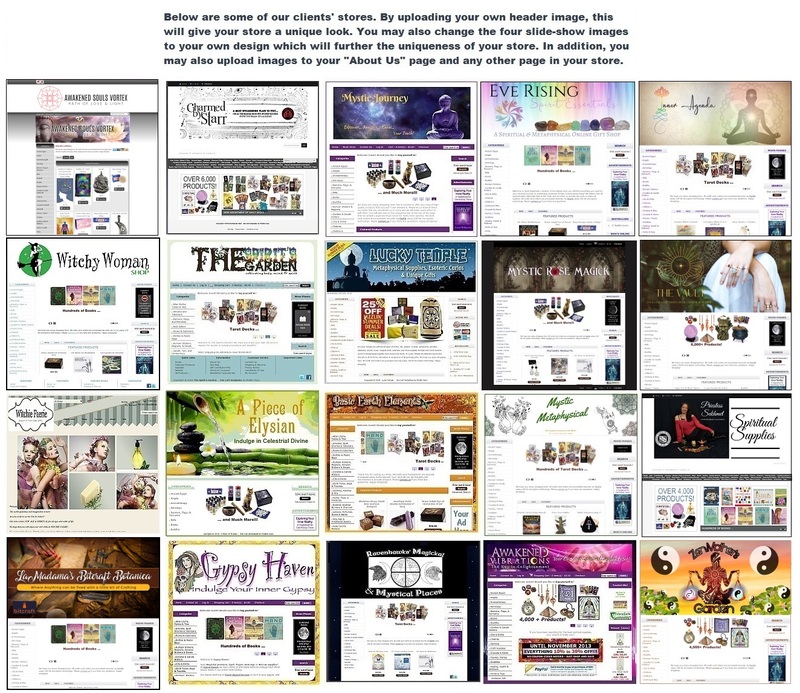 Click here to see screenshots of some of our clients. Add, edit, delete products as you wish. 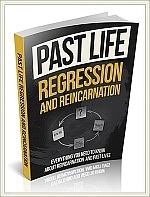 Your store comes preloaded with 4,000+ New Age items, all from one dropshipper. Using a dropshipper means there is NO need to stock any inventory at your place; the dropshipper keeps all of the products in their warehouse and does all the packing and shipping for you. 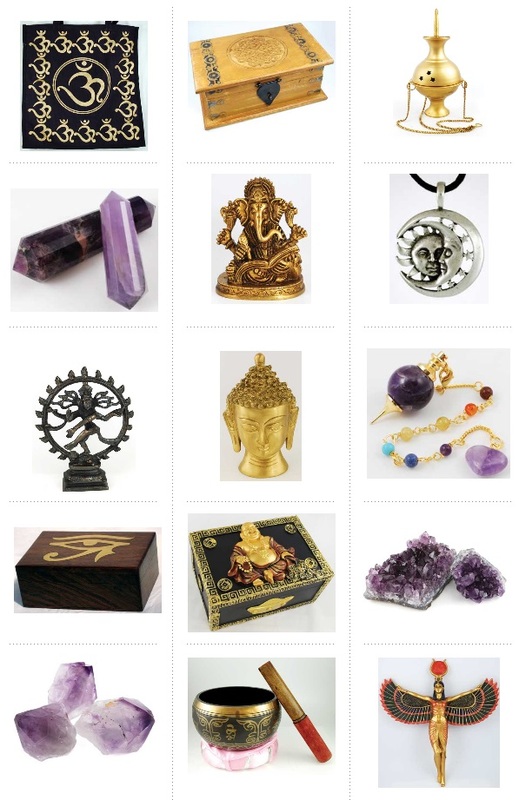 Wholesale — you get true wholesale discounts on all products from the dropshipper: 50-55% off most items (incense, candles, etc. 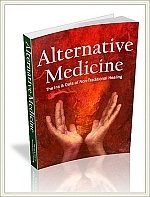 ), 40-42% off on books, music, tarot decks and DVDs, and then they ship directly to your customer (without any of their information anywhere on the order, and using your business name and address on the shipping label). Note: a Sales Tax ID Number or Resale Certificate is required. Accept credit card orders through PayPal. Your customers DO NOT need a PayPal account to order (all they need is a credit card). Other payment modules are available (such as Authorize.net). Shopping cart — Your web shop makes shopping easy, calculating quantities and totaling amounts. It can add your state’s sales tax (if applicable) and add a shipping charge. Express Checkout — Your customers can checkout quickly (no need for them to open an account with you, although that is also an option). Having a way for your customers to Checkout faster means more happy customers and repeat visits. 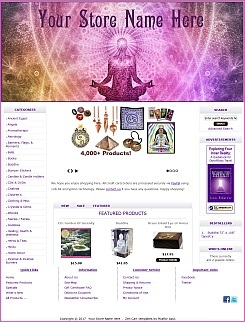 Featured Products — You can select the products that you want to be showcased on the front page of your store. It’s up to you which products get featured, and you can always change it whenever you feel like it. “Shipping & Returns” page — If you want to make any changes to this page, you can edit it through the Admin area of your store. 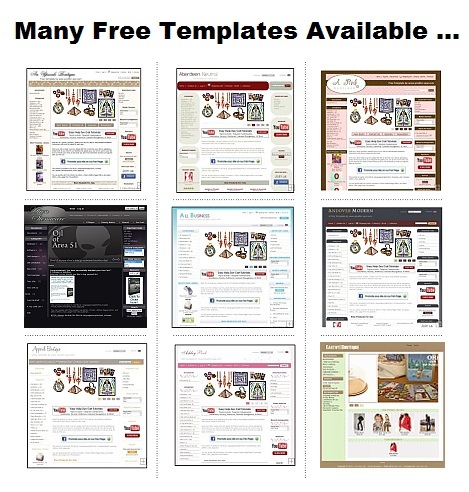 Price: Only $225 to install the store, import 4,000+ products into the database, upload the product images, add your store name, email address, etc. There is also a Help page and Forum available, and you can always email us if you have any questions.